The Black Forest Star Party (BFSP) is an annual dark-sky amateur astronomy observing event hosted by the Central Pennsylvania Observers (CPO). Held every year since 1999, the BFSP generally spans a weekend in the late summer or early fall in Cherry Springs State Park in Potter County, Pennsylvania. Cherry Springs State Park is one of the darkest sites in the state of Pennsylvania and has been designated as Pennsylvania’s first Dark Sky Park by the PA Department of Conservation and Natural Resources (DCNR). The amateur astronomers who have attended the BFSP can testify that the skies can be great! To the right is a light pollution map of Pennsylvania, courtesy of the International Dark-Sky Association. Cherry Springs is located in the middle of the dark area, roughly where the red spot is. It is about as dark here as it gets in Pennsylvania! The Cherry Springs site is also in a large field, at an altitude of 2300 feet above sea level. This makes for one great place to have a star party! Cherry Springs is becoming a very popular place! Many amateur astronomers are holding impromptu or organized events here during the observing season. If you would like more information on Cherry Springs you may visit Thom Bemus’ Web page on the Park. 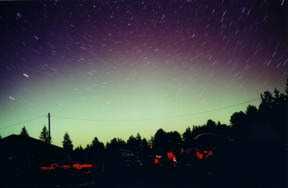 The 2002 BFSP was one of the most spectacular BFSP events, mostly due to an amazing auroral display on Saturday night. While not typical, the photo to the left (and the background of the image at the top of the page, both courtesy of CPO Member and 2002 BFSP attendee Dr. Gerry Santoro) hints at some of the wonder that is Cherry Springs State Park and the Black Forest Star Party.